Cyrus is a flashy and athletic young dog with very nice obedience. He is social with other dogs and loves to play fetch. Cyrus would be great for a busy active family with chidren. 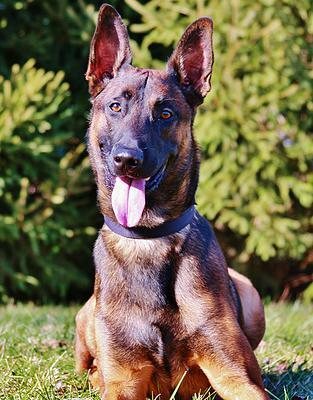 Originally developed in Malines, Belgium, Malinois have a great deal of stamina and truly enjoy working. They are intelligent and very active dogs that excel at many tasks. In addition to herding, they also do well with police work, search and rescue, and in performance events, such as agility. People who are not familiar with the Malinois often confuse him with the German Shepherd Dog (GSD), but there are significant differences in the body structure and temperament of the two breeds. Malinois are smaller dogs with lighter bones. They stand with their weight well on their toes, which gives them a square body profile, while today's GSD has a long, sloping back and carries his weight flatter on his feet. Want to learn more about our protection dogs?